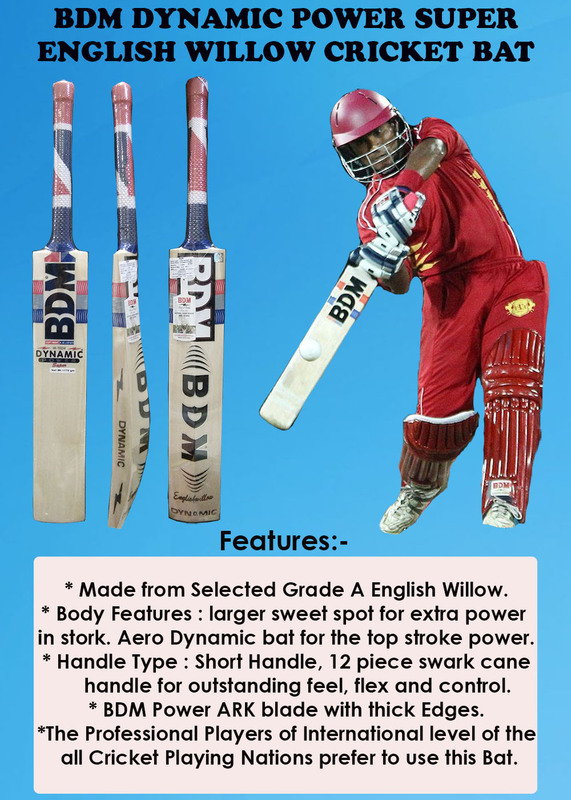 Best 5 BDM English Willow Cricket Bats For Professional Players | Khelmart.org | It's all about Sports. In this blog we have listed the Best 5 BDM professional Level Cricket Bats. BDM company is established in year 1925. 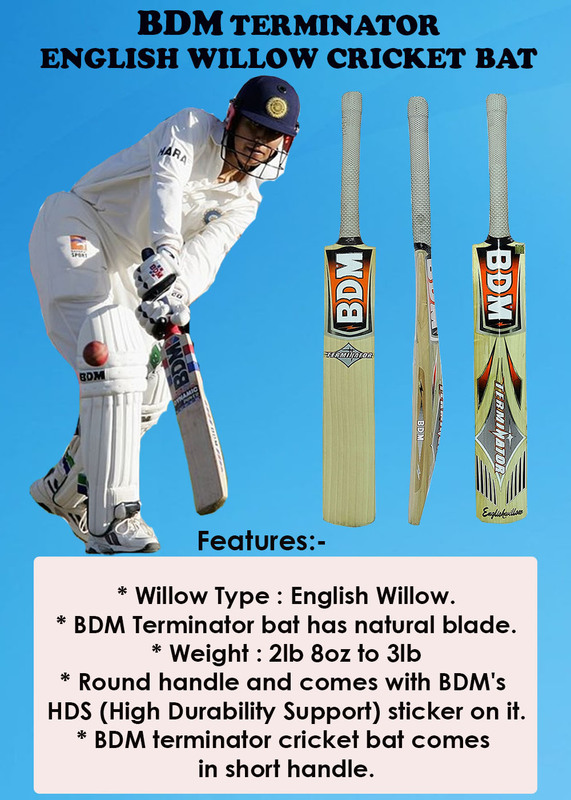 BDM produced quality cricket equipment and export it to around the globe. Super power is top selling bat in complete dynamic series. It is developed with traditional profile which offers great balance to player Bat comes with full back profile which is designed to delivery destructive player’s performance. This bat has been used by a lot of famous international cricketers such as Sanath Jayasuriya, Virat Kohli, Dilshan and many more. Made from the best available grade 1 English willow. Maximum 8 or more straight grains. Perfectly balanced & light pick up. BDM Power ARK blade with thick Edge. A larger sweet spot for extra power in stork. 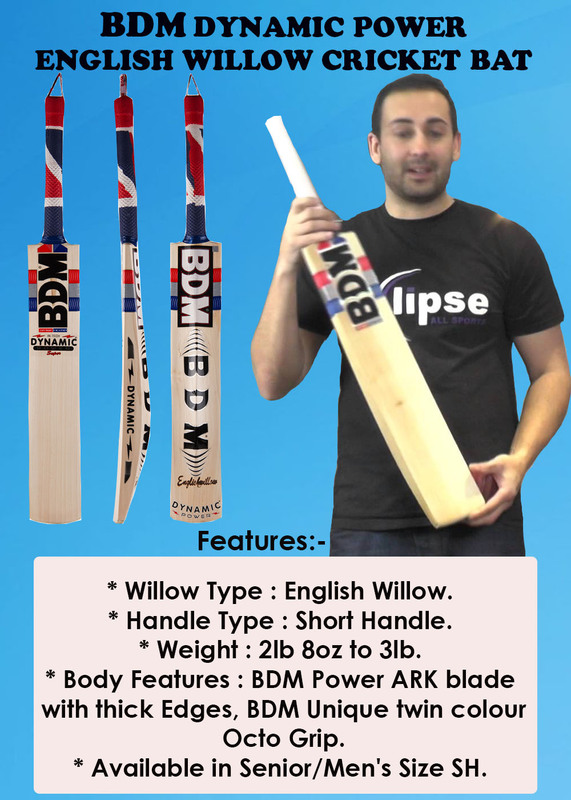 This BDM cricket bat is tested for its 5 star performance.It is manufactured with professional class english willow cleft which gives 7 to 12 straight grains to players. 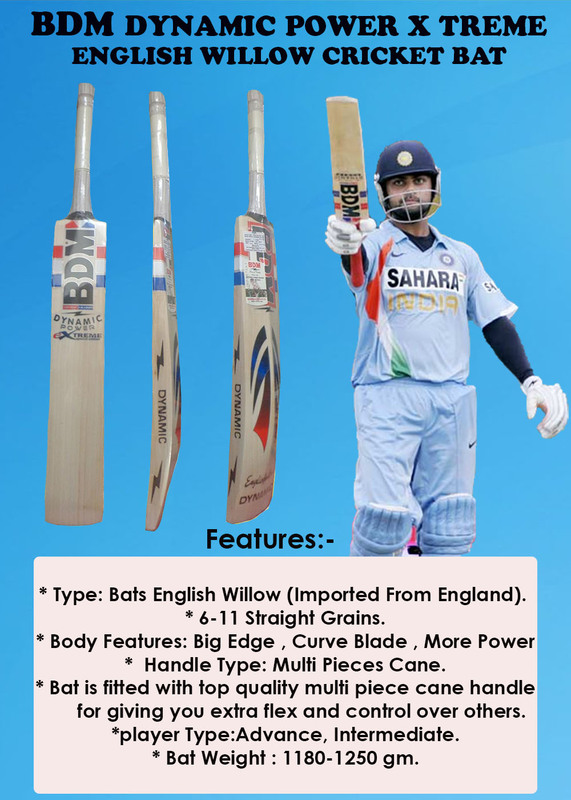 It is equipped with Powerarc blade with contoured edge which ensures best in class power from bat face. Bat is fitted with durable and high quality cane handle which ensures the better performance. This Top Line BDM bats made from UK willow grade 1 English Willow Wood bat. Handle Type: Multi Pieces Cane. BDM Powerarc blade with contoured edges. Maximum straight grains 8 to 13 straight grains. This Cricket Bat is equipped with Famous traditional bow-shaped profile which gives optimum combination of balance and power. It is manufactured with top quality Short cane handle with rubber lamination technique to deliver best in class performance. Further, to improve the overall performance of the bat, BDM provided scale grip which enhance the feel and control. This bat is suitable for those players who want maximum power and precise control on shots. It is one of the top line bats with power arc blade preferred by leading players for match play. To improve the feel and control, BDM fitted full cane handle which give very comfortable feel. 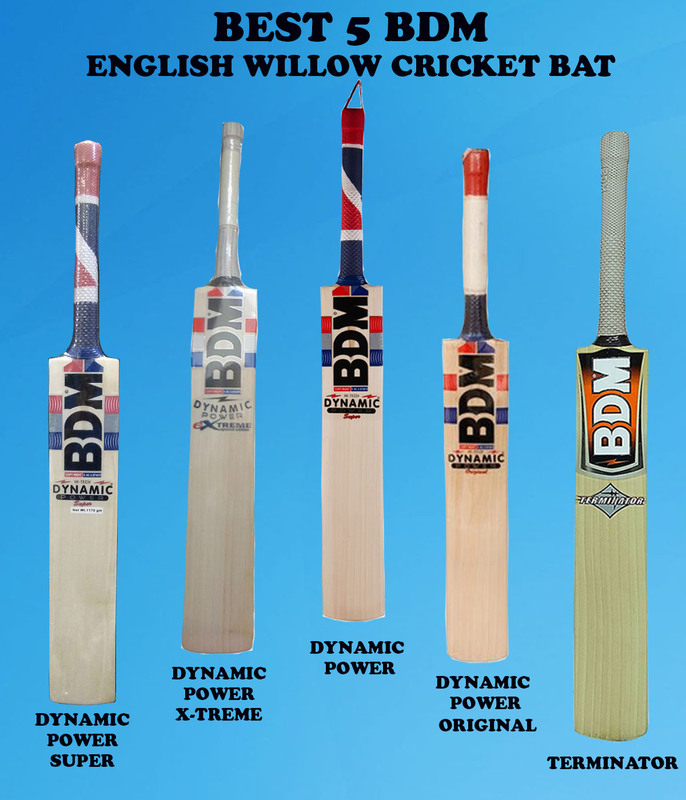 BDM Dynamic Power Original English Willow cricket Bat is made of hand selected English Willow. It is packed with Power Ark blade with contoured edges. It consists of 8 to 10 straight grains. This bat is designed to give top class performance for all kind of surfaces. BDM Putted Extra meat behind the sweet spot will give you maximum power and punch on strokes. It is made from good quality. BDM cricket Bats with unique shape and edges profiles are very famous in cricket community in India and abroad. Made from Grade 1 English Willow. Traditional Shaped bat with power packed edges. Optimum weight redistribution Which Offers better balance & Great pick up. Toe protector for better durability and maintaining the moisture level. This product comes with 1 bat cover, 1 fiber tape and 1 extra grip. Terminator is latest bat launched by BDM. It is made from grade 1 English Willow with hand selected cleft technique. Player will get 8 to 12 straight grains in this bat. This bat sweet spot is placed at middle while its back profile is equipped with fullback which gives enlarged sweet spot for attacking game style. Handle of this bat is made of 12 piece cane which gives flexible but control grip to players. Player will attacking game style will like this bat most. The bat is made from premium quality straight grained willow, its a grade 1 English Willow cricket bat. Bat profile is traditional with mid sweet spot position. Bat handle is made of 12 piece cane handle. Number of grains for BDM Aero Dynamic bat vary between 8 – 12. The bat has a medium profile with shaped with a section removed from the lower bulge to give an extra light pick up. 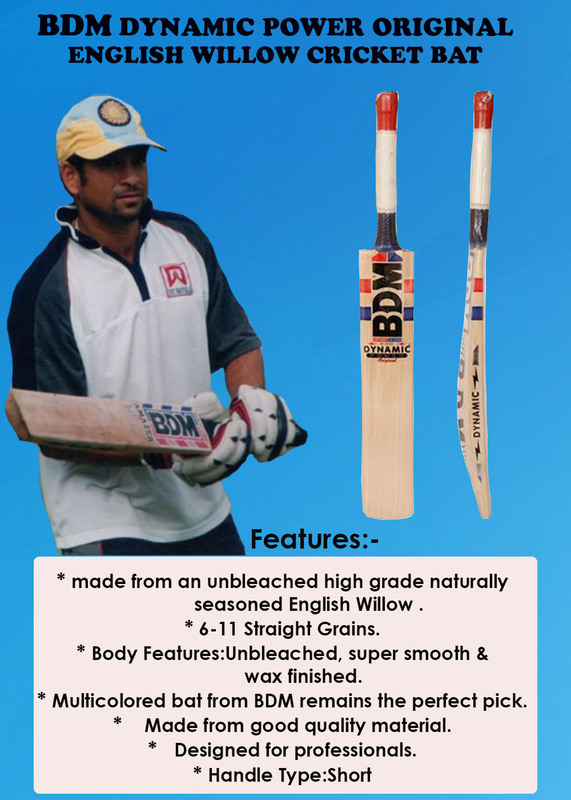 This entry was posted in Cricket and tagged Best 5 BDM English Willow Cricket Bats For Professional Players, Details of Best 5 BDM English Willow Cricket Bats For Professional Players, Images of Best 5 BDM English Willow Cricket Bats For Professional Players, Specification of Best 5 BDM English Willow Cricket Bats For Professional Players. Bookmark the permalink.